Kingston Digital, Inc., the Flash memory affiliate of Kingston Technology Company, Inc., a world leader in memory products and technology solutions,announced today the Managed model of IronKey™ D300 Serialized (D300SM) encrypted USB Flash drive is now available. A fully-encrypted managed USB drive is an essential component in following industry standards and the strong data encryption of the D300 series is what makes this drive compliant for data storage under GDPR and the NY financial regulations. 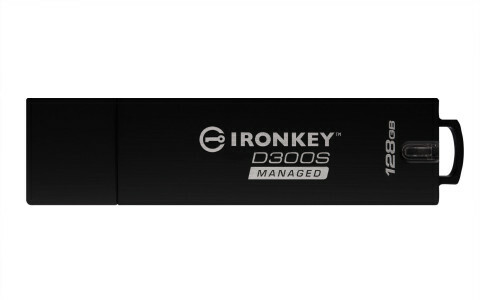 IronKey D300SM requires IronKey EMS or SafeConsole® by DataLocker1 allowing central management of drive access and usage across thousands of drives. Either cloud-based or on-premises, it enforces drive-specific policies, such as password strength and retry limits, lets administrators remotely disable lost or stolen drives, reset passwords when forgotten and more2. This is the first IronKey drive that is supported on SafeConsole, allowing it to be used by customers who already have SafeConsole installed. IronKey D300SM is available in 4GB to 128GB capacities and is backed by a limited five-year warranty, free technical support and legendary Kingston reliability. Encrypted: With encryption, no one can access data that you have stored on the drive without knowing the password. Waterproof 5 : Up to 4 ft.; conforms to IEC 60529 IPX8. 1 IronKey EMS/SafeConsole by DataLocker, purchased separately. 2 Password requirements set by Administrator during set up using IronKey EMS for IronKey D300SM Managed drives. 5 Product must be clean and dry before use. 7 D300SM supports limited Linux commands, such as login, logout and password change.